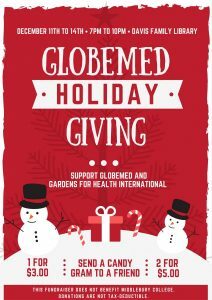 Two Brothers Tavern is partnering with GlobeMed on Thursday, April 13th to raise funds for Gardens for Health International. Come out to Two Bros between 6:00pm-9:00pm for a fun time while also helping us address childhood malnutrition in Rwanada. 10% of all sales go towards Gardens for Health! This event is open to everyone 21 years or older. 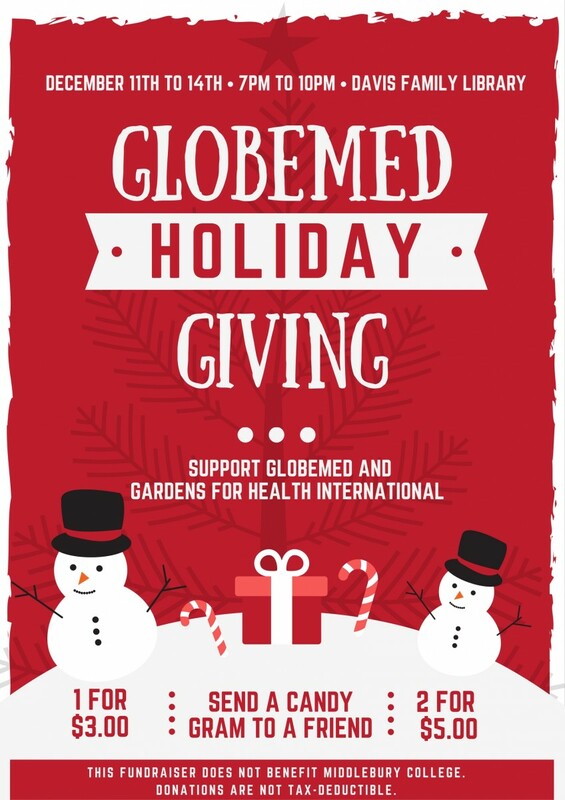 As part of GlobeMed at Middlebury’s mission to raise awareness for, and improve upon the health issues that affect those living in poverty, we partner with a grassroots health organization, Gardens for Health International (GHI). GHI is a nonprofit in Rwanda providing holistic community solutions to malnutrition via agriculture, local government clinics, and health education. This year GHI expects to serve over 2,000 families, which entails equipping patients’ families with resources like seeds and small livestock to create home gardens that support their basic nutritional needs, technical assistance on farming techniques, cooking demonstrations, and training on proper nutrition and health practices to ensure sustainability. Their work can dramatically improve lives, as just one season after enrolling in GHI’s program 81% of children were at a healthier weight. 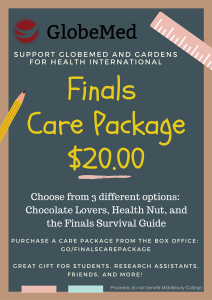 If you would like to learn more about GHI, I’d be happy to to tell you about how amazing they are, or you can visit their website: www.gardensforhealth.org. This year, our project is to raise funds to support GHI’s overhead costs including its office maintenance costs, transportation costs of staff to and from the office, and staff salaries – costs that are difficult to fundraise for but that are crucial to GHI’s operations. 90% of GHI’s team is Rwandan and all of the field staff is from the communities they serve, so overhead is beneficial to the local economies as well. To support our project this year, we have set a fundraising goal of $15,000, and have begun achieving it through various events on campus. Holiday giving is our most substantial fundraiser however; so I’m asking that you please consider contributing any amount to support our project with GHI. You can mail a check to the address listed below, or use our website, http://www.razoo.com/story/Middlebury, which allows you to donate on behalf of someone else, in the spirit of this holiday season! If you have any questions about our organization or our project, please let us know! 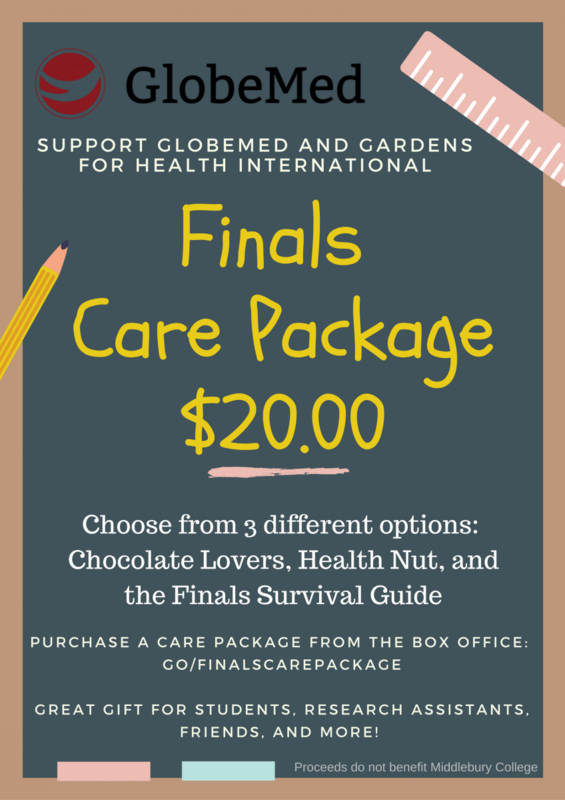 All packages will be delivered to the student’s room during finals week. Chocolate Lovers: Chocolate bars, chocolate covered pretzels, chocolate covered espresso beans, chocolate chip granola bars, brownie granola bars, and Swiss Miss. Health Nut: Dried fruit, mixed nuts, tea, coffee, gum, apples, granola bars, and instant oatmeal. Hey, GlobeMed! Today is World AIDS Day. 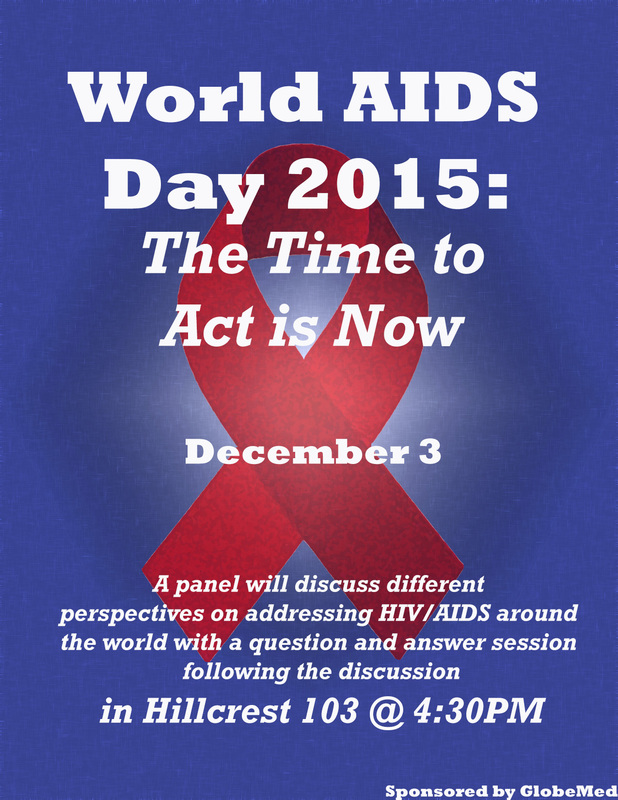 In honor of this event, we are holding a discussion featuring a panel of Midd professors. Come join us this Thursday! Hey, GlobeMed! 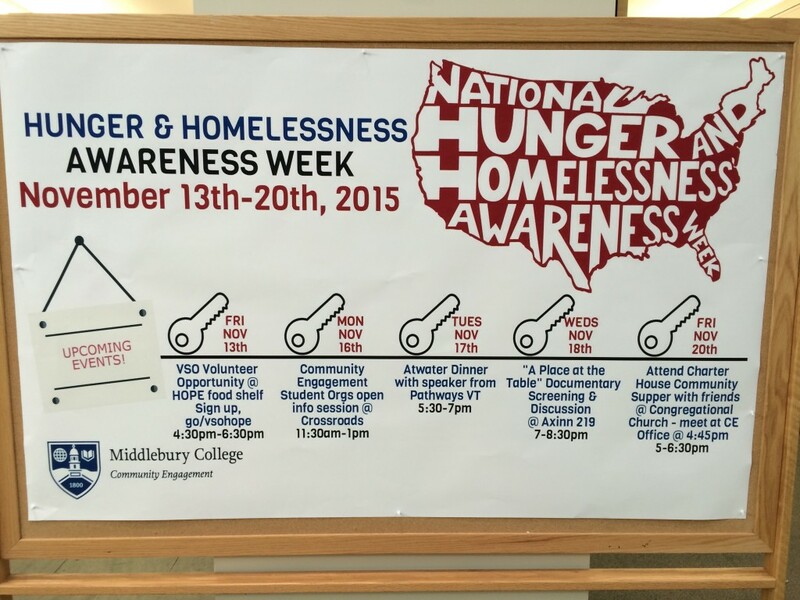 From Nov13-Nov20 it is Hunger & Homelessness Awareness Week, check out this great calendar of events! 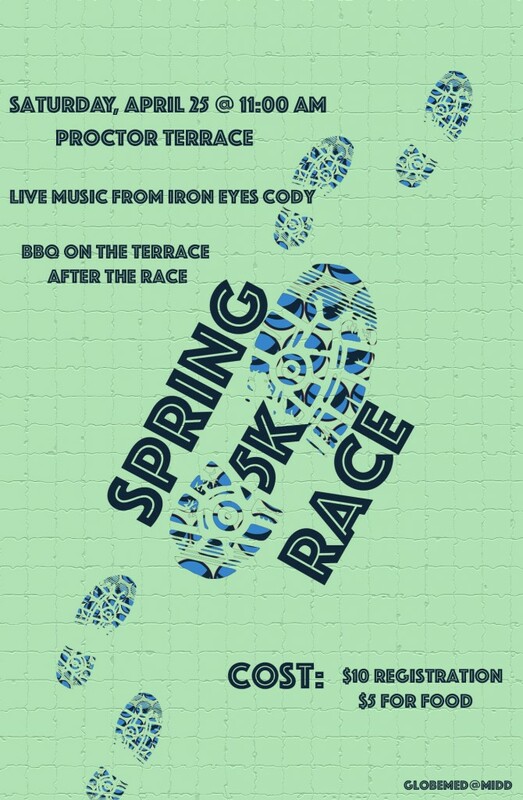 There will be music and a BBQ on Proctor lawn after the race! Cost for the race is $10, and the BBQ is a suggested donation of $5. Also, you’ll be able to sign up on Saturday before the race! Hello GlobeMed! 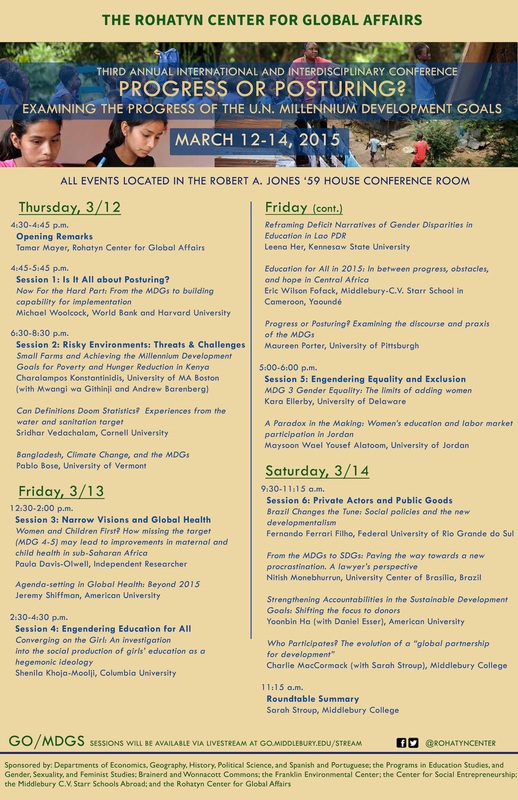 This weekend we introduced the GhU curriculum for this semester…check it out! Hey GlobeMed! Although it’s cold and snowy here, summer is coming up soon and we have some great internship opportunities you should check out this week. Monday, Feb 23, there’s an info session in Axinn 229 from 4:30-5:30 for on-campus internships, research positions and volunteer opportunities. Tuesday, Feb 24, there’s an info session for the Saha Global Leadership Program, a 3-week program in Ghana to train local women how to launch clean water and sustainable electricity businesses.